When making diet changes, it is common, and some might even say mandatory, to use calorie counting as part of one’s strategies. At the outset, it seems simple enough, if we assume that calories in = calories out, then counting our calories in will help us reach our goals. When put into practice, calorie counting can frequently become a lot more complicated, frequently leaving people confused, extra hungry, or giving up their change efforts all together. Let’s explore what calorie counting is and how it may help or hinder one’s motivation and efforts for behavior change. Calories (sometimes referred to as kilocalories or kcal for short) are a unit of energy in the food we eat. The body needs energy from food, but the exact amount varies from day to day due to many factors. Calorie counting is a method of self-monitoring that estimates how much energy (calories) we consume each day. It usually involves an estimated daily calorie goal (or maximum) that one tries not to go over through the day. There are many reasons people decide to count calories. Some people are numbers-oriented, so calories are an easy way to think of food. Detail-oriented people are also drawn to calorie counting as they want to know as much as they can about what they consume. Many people see calorie counting as more precise, which helps them feel in control of their diet, choices, and bodies. In some less common cases, calorie counting is medically indicated (usually while also tracking specific nutrients). When it comes to weight loss, what does the evidence say about calorie counting? Self-monitoring strategies are widely used as part of the behavior change process, and have a long history of research to back up their effectiveness. A systematic review concluded that the use of diet self-monitoring is related to higher rates of behavior change and weight loss with a dose-response effect (meaning more monitoring = more changes at the end of study). Other studies following the weight loss rates of large groups of people have also noted the association of more food records and greater weight losses. So the evidence definitely looks favourable, but there are a couple of important things to keep in mind. First, calorie counting is a common form of diet self-monitoring, but it is not the only option (we’ll discuss alternatives later on). Second, many of these types of studies have drawbacks such as small sample sizes, limited diversity of study subjects, and high drop-out rates. This tells us that for some small groups of people this strategy may work very well, but there are a lot of people for whom it is not a good fit. Lastly, one thing most studies agree on is that even if it is “working”, many people tend to stop monitoring their diets over time, and the behavior change tends to stop as well. As mentioned before, some of the main advantages of calorie counting are seeing the numbers for people who find that helpful, an increased awareness of patterns and overall intake, and a sense of precision when setting goals for behavior change. Many calorie counting apps and programs are designed to motivate and reward tracking, which helps some people continue their efforts. Some people also report increased freedom in food choices and enjoyment of food when they focus only on the numbers and don’t feel “caught up” in the types of foods. Like with any lifestyle habit, calorie counting is not without its drawbacks. The #1 reason users of online tracking programs stop counting is the time required to track. The more detailed the calorie counting, the more time involved, often multiple times per day. Though there are ways to make it easier, varied diets, demanding lives, and foods without easy-to-access nutrition facts labels make close calorie counting challenging. Another common issue is getting caught up in the numbers and losing the enjoyment and social context of food. Whether our calorie goal is realistic or not (and frequently not), it is common to see this goal as a hard line that should not be crossed. Our reaction to going over our target is often to feel guilt or shame, or to excessively restrict (often very nutritious) food in order to hit this goal. Combined, this can easily set up and adversarial relationship with food resulting in stress and poorer health overall. Detailed calorie counting requires honesty and self-assessment. In our drive to perfection and hitting our calorie goals, it is tempting and easy to adjust or even omit some portions or foods so that our journals look good. Because we are generally smart and insightful creatures, this inaccurate record keeping comes with a high risk of backfiring: instead of feeling good about our numbers being “perfect”, one can feel frustrated that their health isn’t changing or internally conflicted about the lack of honesty. Calorie Counting Bottom Line: Yay or Nay? It takes a lot of effort and practice to make lasting dietary changes. Diet self-monitoring can be an effective tool, but you don’t need to track calories to do so. No matter which method you choose, it will take some extra time and honesty. 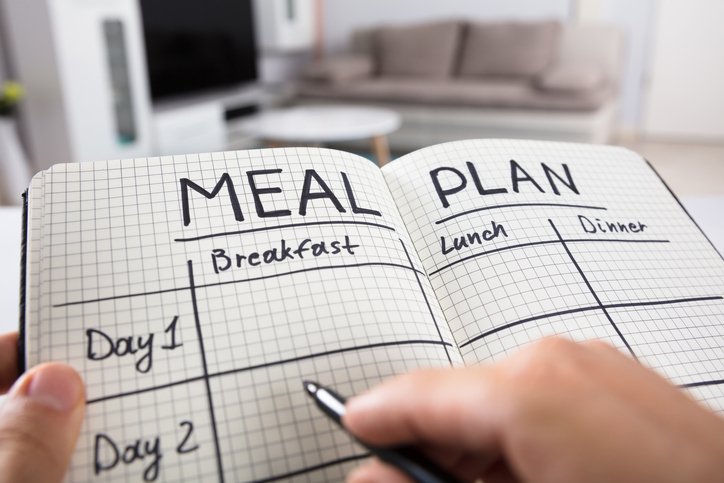 Keeping a log of the foods and meals you eat, especially in combination with assessments of satiety and energy levels, can easily help identify patterns and areas you would like to change. Some people may use tick sheets, others may write journal entries, some people find it helpful to keep a photo log. Choose something that will fit in your life and that you don’t hate; like with any other behavior change, the best method of tracking is the one you can stick with. Before adding in calorie counting, assess yourself and your past experiences. If numbers are motivating or best fit your thought process and lifestyle, it may be a good fit. If numbers seem oppressive or bring out negative thoughts and actions, this may not be the best fit for you. If calorie counting is something that really interests you, make sure to set yourself up for a positive experience. Start by working with the dietitian to set a realistic goal. It may take some trial and error to find the energy goal that keeps you feeling your best. Finally, remember that it is normal and expected for calorie needs and intake to fluctuate day to day; look at the whole picture and not just the snapshot of one day. Burke LE1, Wang J, Sevick MA. (2011). Self-monitoring in weight loss: a systematic review of the literature. Journal of the Academy of Nutrition and Dietetics, 111(1):92-102. doi: 10.1016/j.jada.2010.10.008.